Light, rugged, dependable, transportable, compact. The SAS Tactical Survival bow fits inside most day-packs and bug out bags. The useful storage for arrows (not usually supplied) inside the riser coupled with the camo accessory bag make this everything you need for survival archery inside one neat package. A package that you can easily take anywhere. This is an excellent survival bow. It isn’t as polished as a modern recurve, but for the job it’s been designed for this is an excellent well priced piece of kit. A smart addition to any prepper cache. A you a survivalist or prepper? If you are, you don’t know exactly what you’re going to be preparing for or what situation lies ahead. You want to be ready for as many eventualities as possible. I’ve blogged on several sites about the benefits of learning archery as a survivalist skill. If you really want to be prepared when the SHTF (google it!) you need a bow you can keep in your grab or bug-out bag. Something compact and powerful but easy to lug around. Checkout this piece of kit from the people at SAS (Survival Archery Systems). 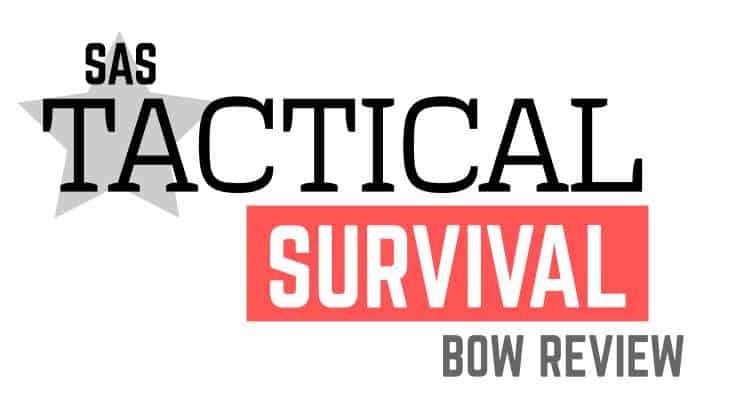 Their SAS Tactical Survival Bow is a great invention that fits exactly your profile. A high quality overview review of the SAS Tactical that includes an in-depth look at assembly, shooting and the component parts of the bow. The riser on this bow is made from aerospace grade T6 Aluminium. If you’re wondering exactly what that means, well… T6 refers to Aluminium alloy 6061-T6 which is commonly used, wait for it… in the construction of aircraft. Sorry, I couldn’t resist… You’ll also find T6 in the construction or bicycle frames, some rifles and car parts. Anything that needs to be light and strong. They even sent it into space aboard the Pioneer. 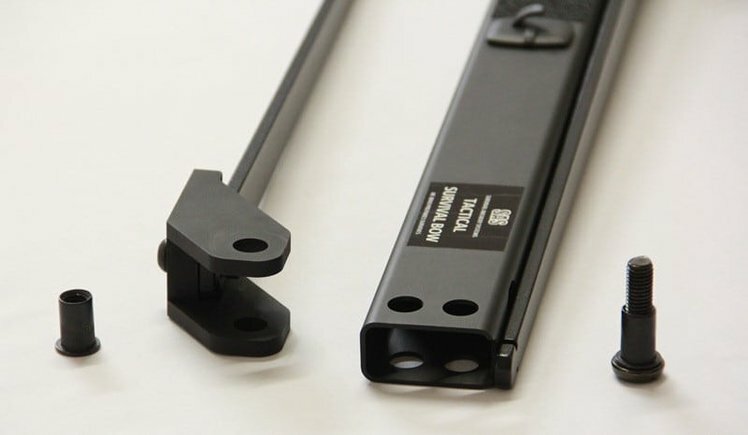 T6 has a tendency to oxidize if exposed to the elements so you’ll generally find it anodized and in the case of this riser also given a surface treatment to make it non-reflective. That non-reflective coating is an obvious boon for staying concealed from your prey in any environment. Although it comes in matte black the riser surface coating can be painted should you want to give it a camo look. Let’s not beat about the bush here, there isn’t really a grip on this bow. You’re basically holding a rectangular piece of aluminium. It isn’t ergonomic, and you may not find it particularly comfortable. The only thing that the bow does to enhance your holding of it is the addition of 2 adhesive pads on either side of the riser. These have the feel of light sandpaper and they do help to enhance the grip on what is otherwise just a piece of metal. They also do a little to help shielding a bare hand from the coldness of the coated metal. Which in certain conditions won’t be a nice thing to grip for any length of time. These pads are only adhered to the side of the bow and may well become unstuck and wear with heavy use, but I suspect they could be easily replaced or even enhanced by an enthusiast. Because that grip isn’t ergonomic, you probably aren’t going to be able to hold it properly.​ Full hand grips are the order of the day with this. It doesn’t snuggle into the fleshy part of your palm between your thumb and index finger like a modern recurve or compound grip would. Because this riser is a hollow piece of strong metal to k​eep it light there is room inside for storage. 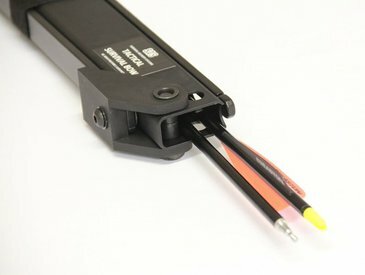 Conveniently SAS also produce a range of 2 piece SAS take down arrows. These are made from aluminium and come with a 400 spine and are 31″ long. The riser allows for storage of upto 3 full arrows inside (6 pieces). However if you are using the bow with the supplied camo bag you can store 5 rear arrow halves inside the riser and 5 front halves inside the camo bag giving you a greater total mobile arsenal. This may be a wise move as whilst aluminium arrows are heavier and more all weather friendly than carbon, they can bend. When the bow is folded for storage there are 2 plastic end caps that fit over the end of the riser to secure the arrows. These when new may be a little stiff to insert and remove, and you can’t assemble the bow without first removing them (and storing them somewhere). Fold this bow down and it’s 21″ long. That’s short enough to fit into most day-packs and bug-out bags.​ In fact that size was specifically targeted by the manufacturers for that reason. 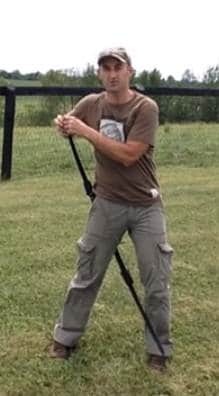 ​The limbs of this bow are made using similar techniques to other modern bows on the market today. Sourced, no doubt, from the same manufacturing plants. Whilst SAS aren’t forthcoming with exactly what that composition is you could probably take a guess at laminated wood and fiberglass. ​The limbs of the tactical hinge from the riser and that hinge is attached using a retaining pin and screw. The retaining pin is made from 316 stainless. 316 is marine grade stainless that is specifically designed to resist corrosion. Whilst it isn’t 100% corrosion resistant it is non-magnetic and in the case of this usage has again been specially treated with a non-reflective coating. The retaining pin bears the load but the screw that holds it in place doesn’t and so it is made from black nylon. This helps to reduce weight and the nylon is less prone to vibrating than previous iterations of the bow that used a metal screw. Remove the velcro retaining strap, remove the end caps on the riser, assemble some arrows (if you’re using takedown arrows). Then you need to remove a retaining pin, flip open one of the limbs. Remove the second limb and reverse the hinge, then re-attach with the retaining pin and screw. If that sounds a little lengthy the reason is because in the takedown position one of the limbs on the riser is reversed in order to keep the folded length as short as possible. Once that’s done, which all only takes a few minutes all you need do is string the bow. SAS themselves recommend the step-through stringing technique where you rest the bow against your foot/calf and bend it around the back of your thigh. Stringing this way you can be finished in a few seconds with a little practice. Don’t be fooled by the product images and some of the online reviews of this bow, it isn’t simply a flip up and shoot bow. It takes several minutes and some practice to be able to assemble this correctly and be ready to shoot. That’s not a bad thing, the process is quick, it just isn’t instant! No arrows are usually supplied with this bow. You can shoot anything you like, it is a bow after all. If you want the arrows recommended and manufactured by SAS specifically for this bow. The ones that split into 2 pieces, are made of aluminium and originally of Easton design. You need to purchase them separately. They aren’t the cheapest arrows so it may be worth getting something a little on the less expensive side if you’re going to practice with the bow and save your takedown arrows for trips or real emergencies. There is no shelf on this bow, you need to stick an arrow rest to the side unless you want to shoot ‘off the knuckle’. The Fred Bear arrow rest supplied is normally either left or right hand specific, and which you receive depends on what you specify when you order. But that is only an accessory and can be swapped out for anything you prefer, the bow itself is usable in either hand out of the box. 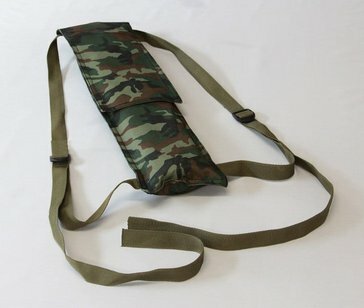 A neat little camo carry case that has an internal pouch for the bow and a second pouch in the flap for carrying accessories like a wrist guard, spare string, arrows etc​. It fits the bow perfectly for transport and doubles as a quiver when in use. The case can be worn like a rucksack over both shoulders and when the bow is in your hand the long pouch in the case makes a perfect back quiver for assembled arrows. As I’ve mentioned already, this bow has no shelf. It isn’t cut to center or anything like that. There is approximately 12.5mm of offset between the path of the string and the path of the arrow past the riser. This will require you to compensate with your aim and perhaps will require a little practice for you to properly get to grips with aiming this bow. This is a functional piece of kit. It looks functional. Styling wasn’t the priority of the manufacturers when they made this. It’s all black and square, hinges and angles. It certainly won’t win any admiring glances at the archery range. You’ll probably just get people asking you what it is. Not a bow to hang on the wall, but that’s not why you need one right? The Spectre II when broken down is 23″ long, that’s longer than this bow. Assembled however the Spectre is much shorter with a 50″ AMO length. The Spectre II is much cheaper than the SAS and comes with 3x free arrows. Weight wise these bows are comparable, there isn’t much in it. The real benefit of the SAS is in the compactness when folded and the slightly nicer accessories supplied. The Spectre also has no in-riser arrow storage like the SAS.. Checkout the full review here. If you need something smaller and less expensive, the Nomad would be a better choice. That breaks down into a 17″ package which is 4″ shorter than this bow. The assembled Nomad however is a short bow with a 48″ AMO which may not be suitable for some people with a long draw. The SAS has a much longer 60″ AMO when assembled and consequently a longer draw. The Nomad usually comes with 3x free takedown arrows, again this is a bonus over the SAS which doesn’t come with any arrows. No reflective coating or aerospace and marine grade metals in use with this one either. It also doesn’t have that neat in-riser arrow storage. More in our full review. Survival Archery Systems are a company with over 15 years of design and development experience. They are a spin of from a design house in the petrochemical and automotive industries and pride themselves in going the extra mile with each and every product that they develop to ensure a high level of quality and safety for the customer.